One of the more extensive examinations of the issue was a 1994 study [Robert] Baade [an economics professor at Lake Forest College in Illinois] did for the Heartland Institute.... Baade looked at forty-eight cities over a thirty-year time spa, examining every U.S. city during that period that had acquired either a new professional sports stadium or arena or a professional sports team (baseball, football, basketball, or hockey). His overwhelming finding was that "professional sports teams generally have no significant impact on a metropolitan economy." 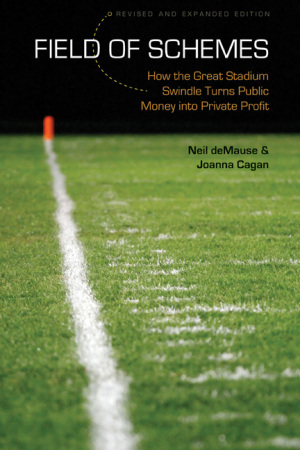 Because of that research, Baade's study "finds no support for the notion that there is an economic rationale for public subsidies to sports teams and stadiums and arena construction. 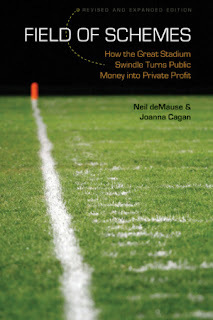 professional sports does not appear to create a flow of public funds generated by new economic growth. Far from generating new revenues out of which other public projects can't be funded, sports "investments" appear to be an economically unsound use of a community's scarce financial resources." Among the thirty cities with new stadiums or arenas that Baade examined, twenty-seven showed no economic impact on their local economy over a thirty-year period. In three instances - St. Louis, the San Francisco Bay Area, and Washington DC - the new facilities appeared to have hurt the local economy. My only problem with Baade's study is that it is now dated. Those sweetheart deals that led to his 1994 conclusions have gotten much sweeter. No better example exists than in Indianapolis where public dollars were used to build an arena for the Indiana Pacers. The Pacers operate the building and get 100% of the basketball and non-basketball revenue from it. Now taxpayers even pay the Pacers $10 million a year to run a building, again a publicly-owned building on which the taxpayers get no revenue - it all goes to the Pacers. Over at Lucas Oil Stadium, the Colts play rent-free and receive 100% of the revenue during the Colts games, 50% of the revenue from non-Colts events. We the public, through the Capital Improvement Board, run the place. Looking for newer information, I found Prof. Baade has issued other reports on the subject, including in 2002, 2006, 2008 and 2010. In January of 2011, he along with an economist at Holy Cross, authored a paper entitled "Financing Professional Sports Facilities." That study can be accessed through this link. The book Field of Schemes can be ordered through this link. The website "Field of Schemes" is also worth checking out.